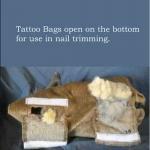 Bunny-Be-Calm Tattoo Bags are made of washable sturdy fabric. Holds the rabbit safely in place for tattoos or nail trimming. 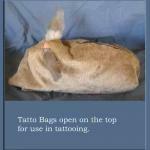 Ear holes on top to release ear for tattooing.